Inside I’m thinking, ‘Can’t you see I’m on the phone?’Obviously not; no one can see if I’m on the phone, or cooking, or sweeping thefloor, or even standing on my head in the corner, because no one can see me atall. I’m invisible. Some days I am only a pair of hands, nothing more:Can you fix this? She’s going,she’s going, she’s gone! One night, a group of us were having dinner, celebrating the return of a friend from England . Janice had just gotten back from a fabulous trip, and she was going on and on about the hotel she stayed in. I was sitting there, looking around at the others all put together so well. It was hard not to compare and feel sorry for myself as I looked down at my out-of-style dress; it was the only thing I could find that was clean. My unwashed hair was pulled up in a hair clip and I was afraid I could actually smell peanut butter in it. I was feeling pretty pathetic, when Janice turned to me with a beautifully wrapped package,and said, ‘I brought you this.’ It was a book on the great cathedrals of Europe. 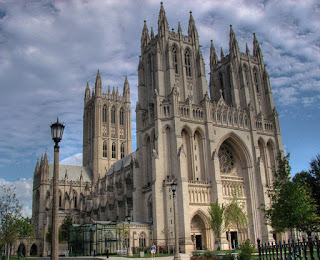 No one can say who built the great cathedrals – we have no record of their names. These builders gave their whole lives for a workthey would never see finished. They made great sacrifices and expected no credit.The passion of their building was fueled by their faith that the eyes of God saw everything. At times, my invisibility feels like an affliction . But it is not a disease that is erasing my life. It is the cure for the disease of my own self-centeredness. It is the antidote to my strong,stubborn pride. I keep the right perspective when I see myself as a greatbuilder. As one of the people who show up at a job that they will never see finished, to work on something that their name will never be on. The writer of the book went so far as to say that no cathedrals could ever be built in our lifetime, because there are so few people willing to sacrifice to that degree. When I really think about it, I don’t want my son to tell the friend he’s bringing home from college for Thanksgiving, ‘My mom gets up at 4 in the morning and bakes home made pies, and then she hand bastes a turkey for three hours and presses all the linens for the table.’ That would mean I’d built a shrine or a monument to myself. As mothers, we are building great cathedrals. We cannot be seen if we’re doing it right. And one day, it is very possible that the world will marvel, not only at what we have built, but at the beauty that has been added to the world by the sacrifices of invisible women." Oh I love how you put a pic on here for the story! I also added that story to my blog! LOL! I think it's wonderful. I don't usually post scrapbooking things on my blog, just started doing that, well, except when I was beginning to dabble into digital stuff. So, all that to say, it doesn't bother me about not much scrapping stuff here! wow! what a great read! i suddenly feel so relieved...even though i, too, smell like peanut butter...and poo-poo diapers!